On any given day, there are characters just waiting to be added to your story--to audition for a part in your fabulous tale. We could fill this blog with posts about the people we have met through the years--people who were ours for the taking, so to speak. You may not be totally comfortable talking to strangers, and that is okay. You will just have to resign yourself to the fact that your stories may not be as colorful as they could be with just your inner circle answering the casting call. 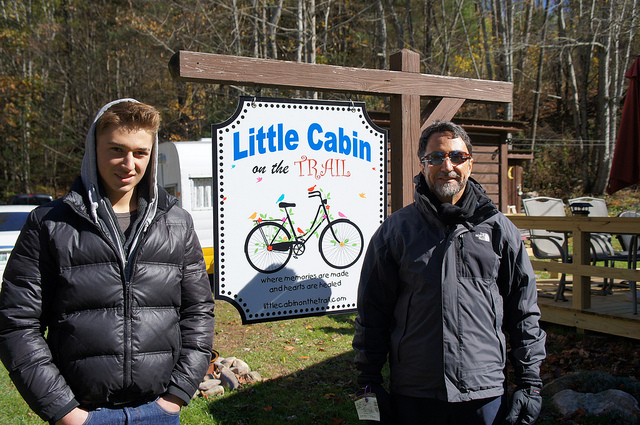 When we bought the Little Cabin on the Trail, we prayed specifically that God would send people to our door that we could serve, in an effort to play forward the kindness that was shown to us in the days and weeks and months following the accident that changed our lives. The cabin most definitely provides us with the perfect opportunity to talk to a lot of strangers; and the tag line on the sign, where memories are made and hearts are healed, is a great conversation starter. People oftentimes want to know the story behind it. We have welcomed in Appalachian Trail hikers--with names like Chef John Wayne and Spectrum--to shower, do laundry, eat, and share their adventures. We have fed a German family that was biking in the snow on the day after Thanksgiving. We have bandaged the wounded, transported accident victims to town, and given tours to the curious--all without being especially gifted in the hospitality or mercy departments. And every single time we show ourselves friendly, we have an opportunity to share our story: the story of hope. We don't just take from my new-found friends; We try to invest in their eternal souls by sharing how God's love and grace continues to see us through. Denise: Just this week I was reminded of one of the most amazing encounters I have had on the trail. It was the end of October 2013, and I was getting ready to head home from the cabin with my two youngest grandchildren. Because of a small family crisis, I was having to leave earlier than I had planned; and as I sat down to eat before putting the kids in the car to leave, I was griping in my head about having to leave before getting to meet anyone. Because I am a storyteller, I actually crave the story. And then, through the window, I noticed two people just standing in front of the cabin staring at the sign. I felt like I needed to go outside to talk to them, so I left my piping hot lunch--and the children--and headed outdoors. You can Google his name and read his story for yourself. You can even watch a movie about it or buy the book his wife wrote about it. It will break your heart. It broke mine--again. This week I finally read the book Eduardo's wife wrote, We've Got Your Husband. It took me this long to work up the courage. And when I finished, I sat in shock. I cannot believe what sweet Eduardo, who stopped by my little cabin and asked if he could give me a hug, had survived. His eyes did not communicate hate or revenge or discouragement. They communicated hope. And herein lies a story that begs to be told--again and again. And so I tell it--again. Do I recommend the book? Yes. As disturbing as it is on so many levels--one being that Eduardo and his wife make no claims to faith in Christ in it--it does, in fact, speak to the condition of this fallen world and its need for a Savior. And it exposes how desperate humans are for hope--real hope. Eduardo's wife, Jayne, also lays a pretty good case for forgiveness. I don't think it was chance that brought Eduardo and his son by the cabin that day. It did confirm, once again, that everyone has a story. His story changed me. My prayer is that my story of faith in the one true God changed him as well. Disclaimer (because I would want to know): There are, I think, three times when profanity is used in the book. I was willing to overlook it considering the seriousness of the situation and how emotionally charged it was. Last year a friend and I took our daughters to the KLove fan awards in Nashville. We had a great weekend watching concerts, meeting artists, and dressing up. For lunch one day we ate at one of the restaurants in the Opryland Hotel, and we got this great waitress. She started the conversation by telling me there was no way I drank sweet tea because I was so tiny. She was wrong. I love a cup of sweet tea, or a gallon. And with that, she started to share. Her favorite food. The cool people she had served. The nicest country music artists. She shared it all with pizazz and theatrics. She even sang for us. In 1987, she sang at the Apollo Theatre, and she continues to aspire to sing more. She loves her job and does it with a cheerful heart. She says some dreams take a lifetime and she will keep working toward her goal. That didn't stop her from giving us a sample of her tunes. She was great. The girls loved her. She gave them her YouTube info so they could listen to her music. It made for an experience that the kids won't ever forget. Last weekend my dance girls and I were at competition for the second year. The months leading up to it were a mess, and every single thing that could go wrong, did. The first dance I had was my duet-turned-solo and let me tell you, I have never been so nervous. Now, I'm not one to get shaky-hand nervous before a performance. Butterflies in the stomach? You bet. But shaky hands and no memory? Very rarely. I found a secluded place to run my dance before I went on stage, and every thing I did was going badly. I messed up steps I had done perfectly the day before. I was fairly certain the performance was going to be a disaster. While I was trying to get myself together, a maintenance man walked by and started talking to my mom and me. He could see just how nervous I was; and he just sat down and said, "I used to be a dancer and you gotta be dancing because you love it. If you go out there and dance because you love it, you'll do just fine." And then he stood up, wished me well, and went on with his day. He didn't give me a grand pep talk or bring out the pom poms to cheer me on, but what he said worked. I went out on that stage, and I did it because I loved it; and I was just fine. This man took the time to actually see me, and his words made all the difference. That is the power of reaching out to people. 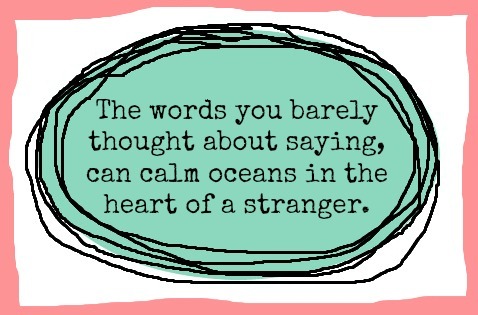 The words you barely thought about saying, can calm oceans in the heart of a stranger---and that is a most glorious thing. Your turn! Have you met any interesting characters lately? Have you ever had a conversation with a stranger that surprised you? We'd love to hear your character stories. You can post them in the comments, on Facebook, or email them to us. Most importantly, be your family storyteller and share them with the next generation.